Many a documentary has been made about World War II, each of which attempt to bring something new to the table. The �something new� in WWII in 3D is New Video�s attempt to cash in on the current wave of 3D titles that are frequenting stores� Blu-ray shelves these days. While on the surface, such a release might seem like a cheap gimmick of a cash-in, the film itself turns out to be well worth a look, if not the best way to show off your new 3D TV. The key component of this 46-minute flick is a never-before-seen Nazi propaganda film that was actually shot in 3D in 1943, and that, alone, despite its criminally short running time, makes this a Blu-ray that any history buff needs to see immediately. 3D technology, albeit, not in the advanced form it is in today, has existed for nearly 200 years. Unbeknownst to many, 3D played a rather large part in World War II as well, acting as a means for the Allied Forces to analyze 3D aerial photographs, which helped them plan their attack for crucial battles like the landing on Normandy. With the 3D format�s recent advancements and popularity, it�s easy to forget its humble roots, let alone that it even existed during Hitler�s reign of terror. Exist it did, however, and exist to a degree that even the most dedicated of historians often gloss over. Whether they�re just uninterested or uneducated about how much 3D technology affected the overall war effort is arguable, but this film at least scratches the surface on the dynamics of WWII in 3D. Sure, it�s tough to justify shelling out a significant amount of money on a 46-minute film, 3D or not. 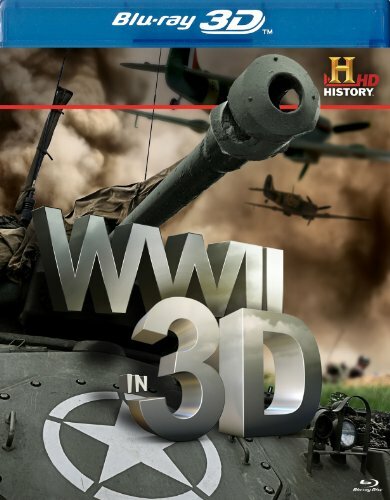 Fortunately, WWII in 3D is well-worth it, if only for the education you�ll receive on how the technology was used during the war. Narrated by Tom Wilkinson (In the Bedroom), the film moves along rather fluidly, with all of the bombast and over-dramatization we�ve come to expect (and generally love) from History Channel productions. The actual quality of the 3D footage isn�t earth-shattering compared to what you�ll see in multiplexes these days, but the 3D photos are still a marvel to look at. Granted, you might have to overuse your remote�s Pause button to get a good look at each and every one, but taking the time to do so will be more than pleasing. The 1080p, 3D video presentation is an overall pleasing affair, with the non-3D footage consistently sporting crystal clear, sharp images, with a bright, vibrant color scheme. The 3D photos vary in quality, which also results in a variance in the effectiveness of the 3D-ness of the images once you put your glasses on. This isn�t entirely surprising given the age of these photos, but overall, their quality holds up quite remarkably. The aforementioned, previously unseen propaganda film, also looks quite good in 3D, but it�s not as exciting to see as some of the 3D photos. The DTS-HD 5.1 audio mix is surprisingly engaging, with a surprising amount of directional effects, considering a near total lack of action-oriented sequences. Tom Wilkinson�s narration is always crystal clear, and blends in perfectly with the rest of the mix. The only real shortcoming of the disc is the complete lack of extra features.